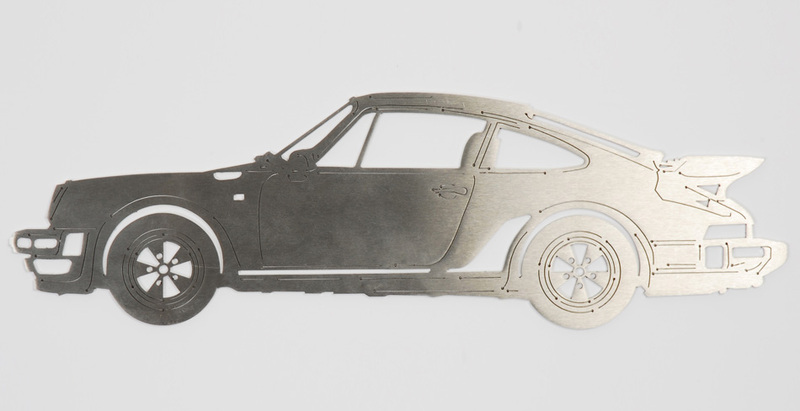 Precision sheet metal work, fabrication, CNC machining, punching and laser cutting. Designing, manufacturing, engineering and printing for 35 years. Our sheet metalwork facility has benefitted from extensive investment in recent years ensuring that we are at the forefront of modern manufacturing techniques. We have CNC multi station punching machines, laser cutting units and CNC brake presses. Our large and extensive facilities enable us to handle high volumes of work with excellent delivery times. The offline programming of our CNC machines enables units to run at full capacity without interruption. 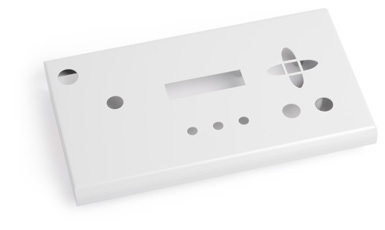 Alternatively we can import .dxf files directly into our system. With in-house tooling facilities we can manufacture high volume industrial components to close tolerances and meet the precision demanded by this industry. We have machinery for graining to give a range of professional finishes to all your components. Our stud and bush insertion is now fully automated. Metal fabricated components and chassis are generally cut from a working size sheet to their finished size by one or more of a number of methods. The actual method employed will depend on the complexity of the shape, quantity, material and accuracy required. In many instances standard equipment and tools are suitable, but often it is necessary to produce special tools or jigs. Our planning office will keep in close touch with you throughout the development and manufacture of your components. We use the latest CAD.CAM.3D Radan software system. We have now perfected this system produce Braille on our CNC punching machine, and already includes the production of cheque templates and Braille credit cards. We recommend you contact us at an early stage in your project to discuss your requirements when we will be happy to offer advice on achieving the best results possible. Metalwork manufactured to the highest standards and tolerances. 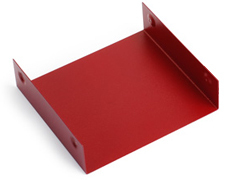 Precision sheet metalwork for enclosures, 19 inch rack panels, aluminium panels and components. Metal fabrications with tools, jigs and fixtures. The latest CNC machining, laser cutting and punching. Large and small volumes with a range of professional finishes available to all components. Fabricated steel panel ready for printing. 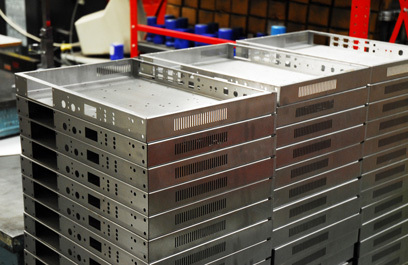 1U Rack chassis in mild steel plated and printed. Aluminium panels - punched, painted and printed. Insertion of threaded studs and bushes. 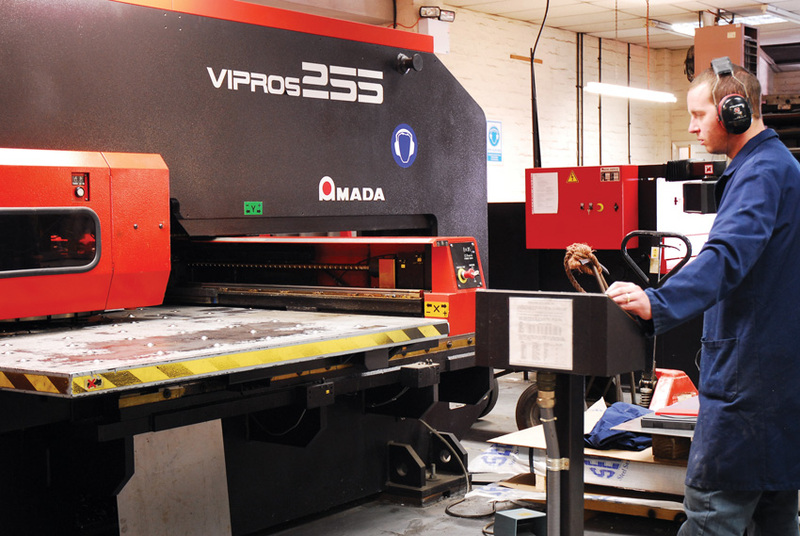 VIPROS 225 CNC Punch Press. Wet Spray, Powder Coating & Stove Enamelling. 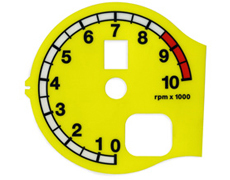 Quality silk screen printing to meet even the most exacting requirements.